Sweet Cicely is an attractive plant reaching a height of about 90cm and with umbels of white flowers in bloom from spring to early summer. The leaves are light green, fern like and deeply divided but their most distinctive characteristic is that they smell strongly of aniseed when crushed. Sweet Cicely has many common names including Beaked Parsley, Cow Chervil, Fern-Leaved Chervil, Roman Plant, Sweet Fern, and Sweet Cus. 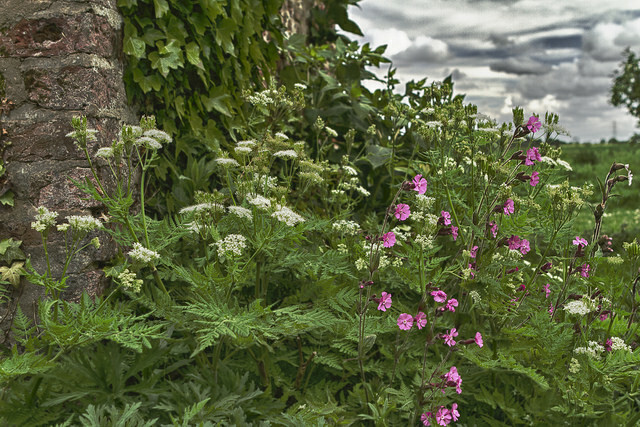 Sweet Cicely is not native to Britain but is in fact a relatively recent introduction (neophyte) and was first recorded from the wild in 1777. Although recent it has become well naturalized and is often common around woodland edges and clearing, grassy banks and road verges particularly in the northern half of England and southern Scotland. Seed dormancy is broken by a period of chilling and therefore sowing must occur in late summer or autumn.